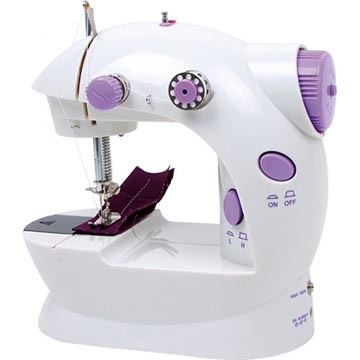 Light weight, versatile, and practical has 2 speeds settings, tension adjuster, and automatic bobbin winder, save time and money making perfect repairs and adjustments to your crafting pieces. 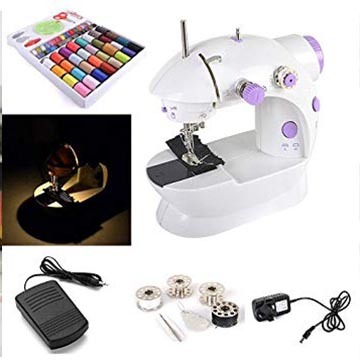 This compact portable automatic dual-speed sewing machine can be operated with mains adapter (UK Plug, included) or 4 x AA batteries (not included).This product comes with AC/DC adapter and pedal leaving the hands free for handing. Specifications: Power: 4.8W; Use DC 6V power or 4xAA batteries; Product dimension: 19.5 x 11.5 x 21 cm; Product weight: 0.7 KG; Package dimension: 22.8 x 13.5 x 21cm. Items Includes: 1 x sewing machine; 1 x AC adapter(UK Plug); 1 x foot pedal; 6 x Bobbins; 1 x Needle & Threader; 1 x 50pcs 10X10cm Printed All Cotton Patchwork Fabric.